"My aspiration is to get these on the market as soon as possible," Adobe Chief Product Officer Scott Belsky told Bloomberg. "There's a lot required to take a product as sophisticated and powerful as Photoshop and make that work on a modern device like the iPad. We need to bring our products into this cloud-first collaborative era." Belsky refused comment on timing, or details of the release. Also not specified is if the release would be for the iPhone and iPad, or just the iPad. If the report is accurate, Adobe will debut the new app at October's MAX creative conference in October, with the release at some point in 2019. Bloomberg claims that "engineering delays could still alter that timeline." Adobe already has a cut-down version of Photoshop available on the iPad. Companion apps for the title were released in 2011, but had little actual functionality. 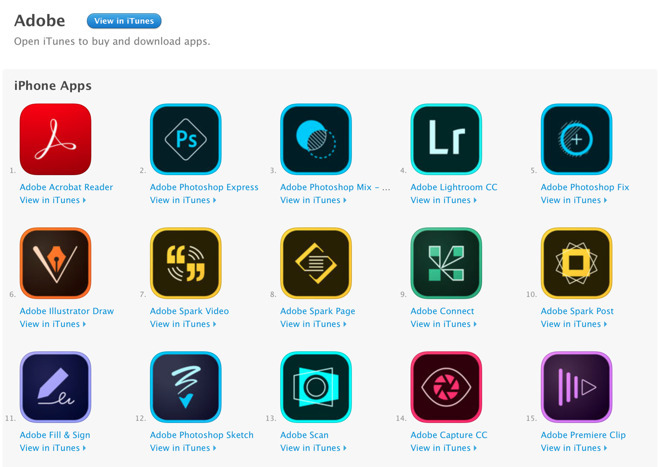 Adobe currently has 34 apps in the App Store. There is no Adobe equivalent to the full Photoshop experience in one title. The existing Photoshop Fix is geared towards retouching and restoring images, using various brushes, and adjustment tools for focus, color, exposure, and saturation. Mix is built around cutting, combining, and layering, though some basic image adjustment tools are present. Photoshop Express is Adobe's the most recently updated iOS app for photo manipulation, and is similar to Photoshop Elements on the Mac.